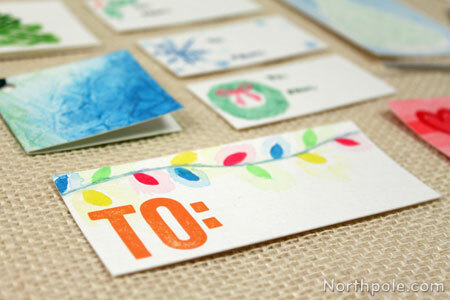 You can achieve some neat effects when painting with watercolor paints, which can make for some unique, but quick gift tags. Some of these techniques might even bring back memories of your art classes in school. Happy painting! Paint watercolor paper with design of your choice. Cut paper to desired size. 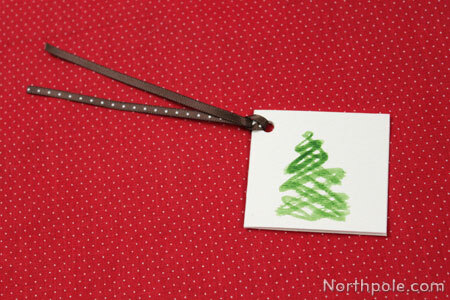 Folded hang tags: cut strips 2 x 4.5", then fold in half. 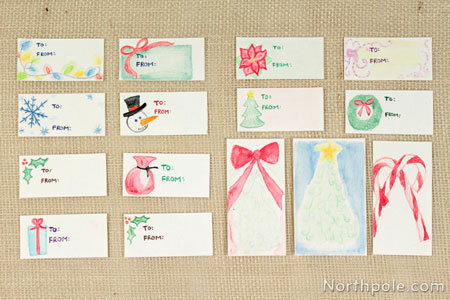 Flat gift tags: cut to desired size. Use a one-hole punch to make a hole for the string. Write in the “To” and “From” info and attach it to a gift. 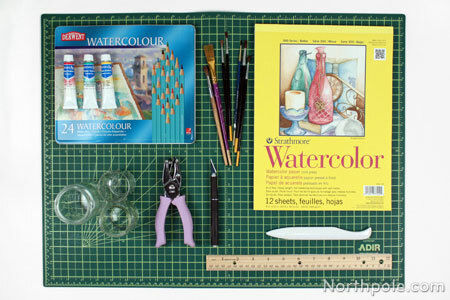 Lay a sheet of watercolor paper on a flat surface. Cover entire surface with paint. Be generous with water, as you don’t want the paint to dry (yet). Take a piece of plastic wrap, slightly larger than the paper, and place it on the paper. 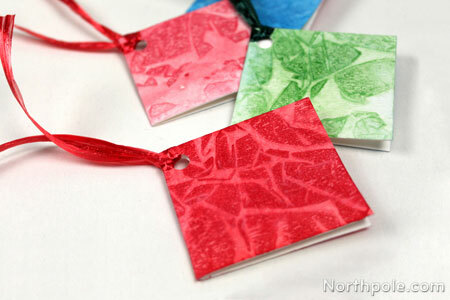 Note: You could use several smaller pieces of plastic wrap to create different designs. As the wrap clings to the paper, notice how certain areas become darker. 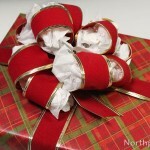 Move the plastic wrap around to make different designs. Move quickly! You want to position the wrap before the paint begins to dry. 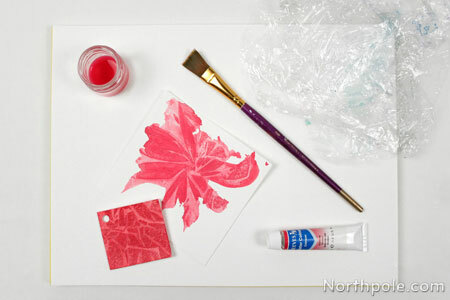 Allow the paper to dry completely, and then remove the plastic wrap. 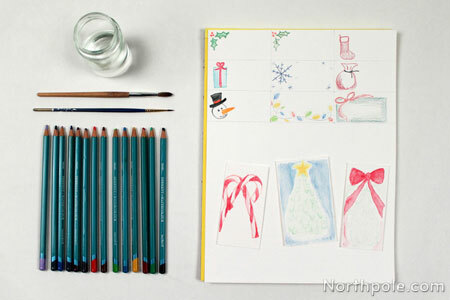 Take a sheet of watercolor paper and lay it on flat surface. Wet a paintbrush with water and brush water over the surface of the paper. 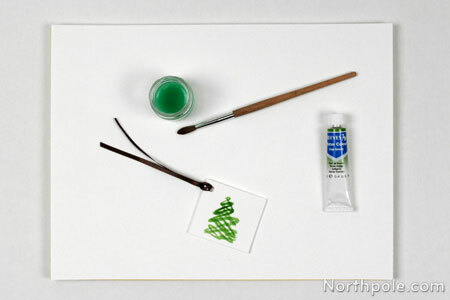 Wet the paintbrush with paint and dab the paintbrush on the paper. The color should bleed and spread on the page. Let dry and repeat steps #1–3 to add more splotches of color. Let dry and cut tags to desired size. If the paint doesn’t bleed, either you need more water on the paper or more water mixed with the paint. 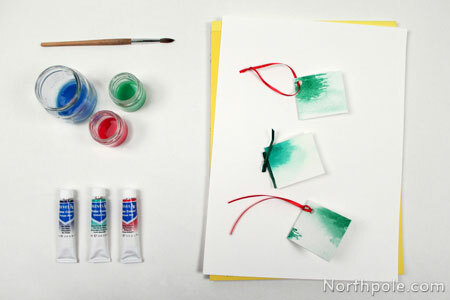 If the paint bleeds too much, or if you have too much water on the page, use a paper towel to blot up excess water/paint. Measure and cut paper to desired size. For this design, we like to cut the paper first so that we know how large we should paint the design to fit the paper nicely. Wet brush with paint; then draw a squiggly line in the shape of a tree. Draw a squiggly line in opposite direction to complete the tree. See the trees in the image below, from left to right: one brushstroke, two strokes, and three strokes. Note: You can wait for the paint to dry in between strokes to create a layered effect. 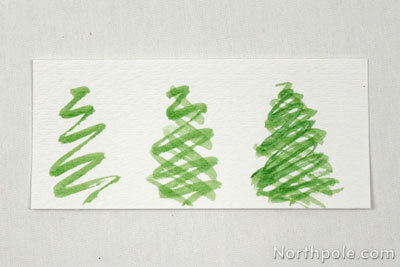 OR go ahead and draw both lines, but be aware that the colors will bleed and the tree will look flatter. We like to use watercolor pencils when drawing simple objects with details. Since watercolors generally yield loose, dreamy-like designs, the pencils are great for capturing details without sacrificing the dreamy nature of the paint. What’s the downside to pencils? If you press too hard on the paper, you end up with indentations on the paper and/or lines that don’t blend. This is not necessarily a bad thing; it’s just something to keep in mind as you create. Measure and cut paper to desired size. Draw designs, shapes, or whatever you like. 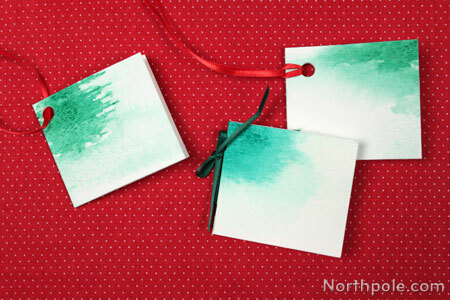 Using a small brush, paint over design with water, one color at a time. Note:�We prefer to let one color dry before moving on to an adjacent color so that the colors do not mix.